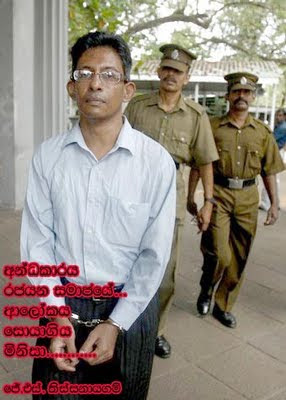 Home » Jailed jaournalist , Media Freedom in Sri Lanka. , Thissanayagam » Jailed journalist Tissainayagam awarded first Peter Mackler Award . Jailed journalist Tissainayagam awarded first Peter Mackler Award . J.S. Tissainayagam, the journalist serving a 20-year prison sentence, was awarded the first Peter Mackler Award for Courageous and Ethical Journalism on Friday. Ronnate Tissainayagam, Tissainayagam’s wife accepted the award, named for a 30-year veteran of Agence France-Presse who died last year, at a ceremony at the National Press Club. Tissainayagam was honored by the US branch of the Paris-based media rights group Reporters Without Borders and Global Media Forum, a company founded by Mackler to train journalists and non-profit organizations to use the media as a tool for social change. Marcus Brauchli, executive editor of The Washington Post, delivered the keynote speech at the award ceremony paying homage to journalists around the world working under repressive regimes. The Peter Mackler Award for Courageous and Ethical Journalism was founded in June 2008 to honour the memory of Mackler, who died of a heart attack that month at the age of 58.The New York-based Committee to Protect Journalists has also selected Tissainayagam as a recipient of a 2009 International Press Freedom Award. Peter Mackler, 58, a veteran journalist with Agence France-Presse, died June 20, 2008 after having an apparent heart attack at work in his Washington office. He had been AFP's chief editor for North America since 2006. Mackler, an American, joined AFP in 1979 after beginning his journalism career at United Press International in New York. As a reporter or editor, he covered the Gulf War in 1991; conflicts in Bosnia, Kosovo and Afghanistan; Palestinian and the Sept. 11, 2001. The Peter Mackler award rewards journalists who fight courageously and ethically to report the news in countries where freedom of the press is either not guarantied or not recognized. Integrity, passion, and a never-ending desire to have the news reported accurately were trademarks of Peter's style of reporting.